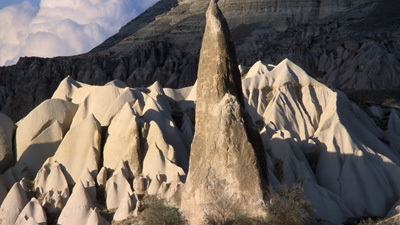 "Cappadocia is the best meditation centre. It is another planet. Here you can witness unforgettable sunrises, sunsets, and full moons"
Over the centuries the wind and rain set to work, eating through the layers the hard rock on top until eventually the amazing moonscape of rocks and cones and valleys that you see today emerged. 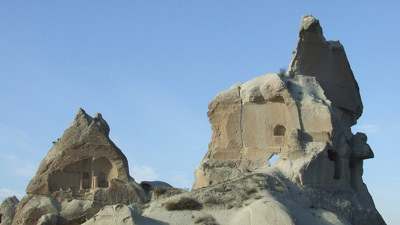 In early medieval times Cappadocia was port of the Byzantine Empire and Christian settlers soon realised that you could carve churches and chapels, even whole monosteries out of the rock. When Arab incaders threatened them, they even built whole cities underground where they could hide for weeks at a time. 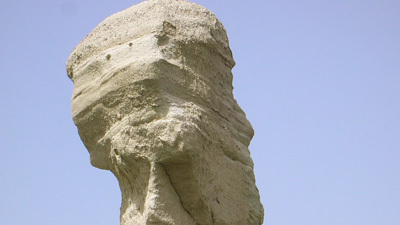 Even today many local people including Mehmet live in houses thet are partly carved out of the rock.